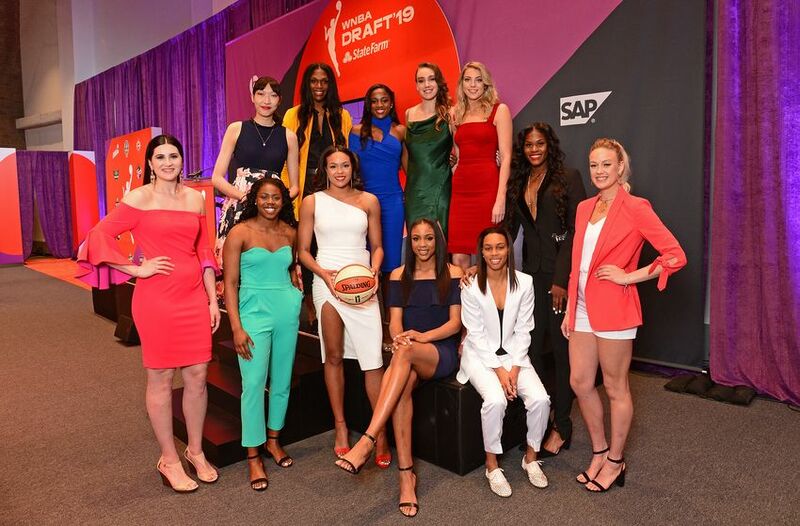 The culmination of a lifetime’s worth of hard work occurred for 36 talented young women on Wednesday night at the WNBA Draft in New York City at the Nike headquarters. TODAY'S THE DAY! We are reporting live from #NikeHQ for this year's #WNBADraft! Make sure to check back in all night for BTS footage, interviews, and more! The first of those dreams that came true turned out to be one of the Notre Dame standouts – one of which there are many. With Sabrina Ionescu deciding to remain at Oregon for her senior season, that created a ton of intrigue as to which direction Bill Laimbeer and the Las Vegas Aces would go in with the first overall pick. Filling a need, they drafted Jackie Young from the Fighting Irish first overall. This was the scene as Princeton native, Jackie Young was selected #1 overall in the 2019 WNBA Draft. After the Aces selection to bring Young to Sin City, the New York Liberty were on the clock, fresh coat of paint, new rebrand and all. Louisville’s Asia Durr was long slated to be, per plenty of mock drafts, the #2 pick to New York even with the Ionescu news, although some drafts had her going tops overall to Vegas. Durr was one of the many draftees on hand that got a first-hand taste of what New York City is like. She will for sure continue that now as Katie Smith and the Liberty selected the Cardinals’ standout second overall. Up next were the Indiana Fever at the No. 3 pick in what is for sure the next step in their post Tamika Catchings rebuild. That rebuild has included Kelsey Mitchell and Victoria Vivians, the latter of whom will miss this upcoming season. Indiana and Pokey Chatman took the next step in that rebuild as they went to Starkville, Mississippi for their latest addition, selecting Teaira McCowan with the third overall selection. It would only be a matter of time before the first UConn player would be selected. The 2019 season will be the first for head coach James Wade, leading a Chicago Sky team that has the ingredients of being a potential darkhorse. The final lottery pick of the first round ended up being the first Husky selection as Katie Lou Samuelson will soon call the Windy City home. Teams will have a hard time guarding the perimeter when playing the Sky. Between Allie Quigley and now Katie Lou Samuelson? Eat your hearts out, Golden State Warriors. Up next were the Dallas Wings, who have had the most interesting of offseasons between Skylar Diggins-Smith’s pregnancy announcement, the hiring of Brian Agler as head coach, and the question mark that has become will they or won’t they trade Liz Cambage. There was lots of talk that perhaps a trade could occur on draft night, but it would not involve their first pick as they selected Arike Ogunbowale of Notre Dame. Up next, the Minnesota Lynx – another team in transition with the absence that Maya Moore will take this year. Two picks after the Sky selected Samuelson fourth overall, another UConn Husky was selected as Napheesa Collier will don a similar shade of dark blue in the Land of 10,000 Lakes. Kim Mulkey, head coach of national champion Baylor, was at the draft in anticipation of whichever team(s) would select either Kalani Brown or Chloe Jackson, both heroes for their roles in bringing a national title to Waco. Brown may fit in very well with the Los Angeles Sparks – the team that drafted her with the seventh overall selection. Just like Brown in her Baylor days, the Sparks have had their fair share of championship games as of late. Maybe she would be part of a Sparks package in the event of an LA trade? So far, there has been no trade. Only the selection of Brown as the No. 7thth overall selection in this year’s WNBA Draft to Los Angeles. After that, it was the Phoenix Mercury’s turn as they have been a team over the past few seasons that has got dangerously close to competing for another WNBA title, but had fallen just short. Could the drafting of Alanna Smith as the eighth overall pick change Phoenix’s fortunes? We shall see. Then came the ninth pick of the draft…and just like the Phoenix Mercury before them, the Connecticut Sun also were thinking west coast as they chose Cal’s Kristine Anigwe. The 9th overall pick in the 2019 #WNBADraft and our sixth Bear drafted in the last seven years! “I’ve been looking up to a lot of the players on the team, so to join this team is really great…Connecticut is a really really good team” – @KristineAnigwe talking with the local media. For the Washington Mystics’ first pick, all they did was look to the state that borders Virginia to the south – which is North Carolina. More specifically NC State – Kiara Leslie from NC State that is. Last year, the Atlanta Dream were perhaps one late Angel McCoughtry injury shy of advancing to the WNBA Finals. After all, Nicki Collen did win Coach of the Year with a team that came out of nowhere down the stretch to Washington everything it could handle and then some in the semifinals. The Dream had the same idea the Wings had earlier by choosing one of Notre Dame’s notables. They went with Brianna Turner, but later in the draft her rights were traded to the Mercury. The defending champion Seattle Storm closed out the first round, and they also thought with an idea of choosing an overseas player for its pick. The Storm drafted forward Ezi Magbegor from the Opals for that pick. This means the colors that she will wear for the Storm should be awfully familiar. Three players later, the Mercury had an opportunity to select again as they started the second round. Their selection which came from the Fever via the Aces was Missouri’s Sophie Cunningham. After that, it was the Liberty’s turn and in a somewhat ironic move given the team recently got purchased by an executive at China-based Alibaba, chose Han Xu of China as their first pick of the draft’s second round. After that, it was the Sky’s turn again and they apparently watched this year’s NCAA women’s tournament as well as the Baylor Bears’ game against Notre Dame for the national title. It may have disappointed many a Fighting Irish fan in Chicago, but now Young – now going from South Bend to the City of Broad Shoulders – has a chance to apply her skills (and championship pedigree) through her college days to the W.
The third Notre Dame player behind Young and Ogunbowale ended up with the Lynx as well. Jessica Shepard was somewhat of an unsung hero in South Bend with so many attention being focused on Ogunbowale. Shepard was chosen by the Lynx as the fourth pick of the second round. The fifth pick of the second was the Dallas Wings pick and they used it on someone who has become more ballyhooed over the last few days, months, and weeks in the lead-up to the NCAA tournament. Megan Gustafson may have played for Iowa – a program maybe not as storied in women’s basketball as is UConn or Tennessee, but sometimes, it is really the player that matches. The Lynx had two of the following three picks after the Gustafson selection. The first in a trade they got from Connecticut, was Natisha Hideman followed by the Sparks picking another Notre Dame player in Marina Mabrey with the 19th overall pick. After that, the LA rival Lynx chose again, getting Cierra Dillard out of Buffalo. The Sun (in a trade they got from the Sun per the Dream) was Bridget Carleton out of Iowa State. The Wings (in a trade they got from the Mystics), chose Kennedy Burke out of UCLA. The Dream’s selection ensured that an Oregon player would get drafted even if it was not “that” Ducks player. Atlanta chose Maite Cazorla and after the Dream’s pick, Seattle went with McCowan’s teammate at Mississippi State in Anriel Howard. Here’s the third round of picks. Thank you for checking out our page during the 2019 #WNBADraft! We can’t wait to see what the newest members of The W do this season.